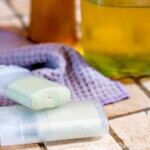 Natural Homemade Deodorant for Sensitive Skin - Oh, The Things We'll Make! Soothing, yet effective, this natural homemade deodorant stick works without baking soda nor coconut oil and uses zinc to help combat odors for those with sensitive skin. I'm so excited to finally be able to share with you a natural, homemade deodorant for sensitive skin that actually works! Over the years, I've tried so many different natural homemade deodorant recipes, but all of them were either ineffective, irritating to my skin, or just plain too messy to use daily for the rest of my life. I've been on the search for a decent natural homemade deodorant for years now. Long, long ago, even before I started trying to live a more natural lifestyle, I even had issues with a lot of “normal” deodorants not working for me. I tried everything from detoxing and eating mostly fruits and veggies for awhile after hearing that often body odor is diet related. I tried supplementation, but that didn't seem to help me much either. For awhile, I was even buying some strange sort of special 2-3 day deodorant that I found here in Spain. It was a conventional deodorant, made to last for several days without needing to reapply, but I was using it daily. That, of course, concerned me a bit. I wanted something more natural, so I turned to those weird crystal deodorants that you have to get wet with water and then apply under your arms. Unfortunately, not only did I find them messy, and not 100% effective, but I ditched the idea when I learned that the active ingredient was an aluminum salt. I mean the whole reason I was ditching the conventional deodorants was to try to avoid as many toxins like aluminum as possible, right? Many will call me irrational and argue that they are perfectly safe, but why take the risk, especially when I have cancer and Alzheimer's running in my family? I wanted something that was aluminum free, so I turned to the internet and began using a mixture of mostly coconut oil and baking soda. At first it seemed to be working out well for me, but when I started to try to exercise while wearing it, or even just at certain times of my cycle, the baking soda would become way too irritating for me and I'd end up with very red and sore, chaffed armpits. If I ditched the baking soda and just used coconut oil, whose antibacterial properties are supposed to work as a deodorant alone, it was if I hadn't applied anything at all. Coconut oil did absolutely nothing for me, and only left me feeling a bit messy. Because the baking soda irritated my skin, I began to try out numerous baking soda free deodorant recipes that I found on the internet. Most of these recipes again used coconut oil, but either replaced the baking soda with clays (like bentonite clay), essential oil mixtures, or both. I guess the clays are supposed to help absorb the moisture, something that I wasn't as worried about, and the antibacterial qualities of the essential oils are supposed to help combat body odor. While they did help somewhat, they definitely weren't enough to keep me smelling fresh, and my husband was only all too willing to tell me how ineffective they really were! At one point, I even spent a small fortune buying the ingredients to try out a natural homemade deodorant recipe that used neem oil, and it smelled so bad that just by wearing it I smelled worse than the body odor that I was trying to avoid! Plus, it didn't work, and the mixture of neem oil and body odor was nauseating enough that I couldn't sleep well the first night I applied it. My husband was, once again, happy to make sure I knew. Sigh. Baking soda was irritating to my skin, but it did work for me, so I decided to try again. I figured that it was probably the abrasive nature of the powdered form that was causing me problems. For several months, I filled a rollerball deodorant container with baking soda dissolved in water. I sometimes added a few drops of an essential oil like tea tree oil to help with its antibacterial qualities. Baking soda and water actually worked pretty well, and most of the time wasn't even irritating to my skin! I did have an occasional flare up, but usually months would pass between them. It wasn't this messy every day, but I often found white drips like this in my bathroom after using baking soda and water! The real problem, though, was that it was very messy to apply. The baking soda solution was completely liquid, so it usually ended up all over the place, leaving a white powdered mess behind once it dried. I got sick of always having to clean up afterward, and my husband started to complain about the white stains everywhere when I unwittingly left a few drops behind. It also left white marks on my clothes like spilled toothpaste. They were easy enough to clean, but I got sick of the white spots showing up on my clothes all of the time. Why does baking soda work as a natural homemade deodorant? Baking soda is an effective deodorant because it alters the pH under your arms, making it a hostile environment for bacteria to form. In the case of baking soda, a base, the pH is raised enough to help combat body odor. Do acids like Vinegar, lemon juice, and citric acid work as natural deodorants? Lowering the pH is another great way to prevent body odor. That's why vinegar is another natural deodorant that is used by many, and I was effectively using it myself for months at a time. There were several problems with using vinegar as a deodorant, though. I had to apply it when my husband wasn't around because he can't stand the smell of it. Fortunately, the scent of vinegar goes away when it dries, so it can be an effective deodorant that doesn't smell bad. Unfortunately, although it worked, for the most part, there were days that midway through the day I could tell that it was no longer working. I reapplied, when I was able, but when I started applying too often, I ended up with red, sore armpits again. I tried using lemons, but didn't like “wasting them” as a deodorant, plus I had similar issues with lemons as I did with vinegar. For awhile, citric acid dissolved in water was my go to natural deodorant recipe of choice, but, again, it was hard to find a concentration that would be effective without irritating my skin. Still, it was what I was using up until recently, when I made a discovery by accident! I told you I tried a lot of different natural homemade deodorants! How does zinc oxide work as a deodorant? Zinc oxide has antibacterial qualities. In fact it works against both gram positive and gram negative bacteria. If you have no idea what that means, don't worry. It just means that it's effective over a wide spectrum of bacteria, so no matter what bacteria is causing your odor issues, you should be covered. As I mentioned before, body odor comes from perspiration combining with the bacteria on your skin, so if you can create a hostile environment for the bacteria by either altering the pH (baking soda, vinegar), or by using something with antibacterial properties (essential oils, zinc oxide), you can prevent body odor from developing. Zinc oxide alone in a deodorant works fairly well which I found out by accident one day when I applied a homemade sunscreen (post idea?) to my red, irritated armpits when I had no other creams or lotions on hand. Not only did it help calm my irritated skin, but I was surprised to find that I had no unpleasant body odor, despite not wearing any deodorant of any type. Zinc oxide powder, green matcha powder, and zinc ricinoleate beads. I really started to look into zinc for deodorants, though, when I noticed that zinc ricinoleate, a zinc salt that I had bought to prevent acne in a homemade facial cream, was also sold as a deodorant additive. Zinc ricinoleate comes from ricinoleic acid, a fatty acid found in castor seed oil. If you saw “ricin” in the name and were concerned about it, you'll be happy to know that although they come from the same place, castor oil and ricin don't mix. Ricin is water soluble, so it doesn't get mixed into the castor oil. Any leftover ricin that may enter the castor oil when it is extracted will no longer be an issue because the proteins in ricin are deactivated by the heat used in the process of castor oil extraction. The mechanism for zinc ricinoleate working as a deodorant isn't exactly known, but it is thought to absorb the odors somehow without inhibiting natural perspiration. When I received my package of zinc ricinoleate, it stated on the package that zinc ricinoleate “covers (I'm translating from Spanish, here, so I'm not sure I'm using the perfect translation, but…) the bad odors that are caused by the bacterial decomposition of sweat so that they aren't perceived as unpleasant.” I've tried to research the exact mechanism of “covering” the odor, but it seems like it isn't well understood. Most places that talk about it just say that it has a way of absorbing the bad odors. If you don't have zinc ricinoleate, you can most definitely try to make the recipe without it. As I stated earlier, my homemade zinc oxide sunscreen was enough to combat body odors without any. Because I had it on hand, and it is an ingredient specifically purposed to deodorize, I figured I may as well add it to my recipe to give it a little extra strength, especially now in the summer when I'm sweating a lot more. Zinc ricinoleate, though, is a very inexpensive ingredient, and it shouldn't be that difficult to find if you intend on making deodorant in the future. It comes as a sort of waxy bead that you melt along with the beeswax into the other oils. If you omit it, there is a chance that your deodorant stick will be a little less solid, but you can avoid that problem by adding in an extra gram or two of beeswax. How well does this homemade natural deodorant with zinc oxide work? I've been using this homemade deodorant ever since I got home from the US last month. It's been hard for me to keep it off the blog because I've been so excited about how well it's working for me, but I wanted to make sure that I gave it a good try for long enough before sharing it with all of you. Not only has it worked through many-a-workout and walking outside on hot summer days, but it hasn't caused any irritation at all. In fact, I think it has helped sooth my armpits and has kept me from getting chaffing when I walk or run without any sleeves. In the past, despite the heat, I'd have to wear short sleeves when walking or running to avoid friction rashes, but I've been able to workout in tank tops and sports bras lately! You can't even begin to know how happy I am about that! So, are you excited to begin? 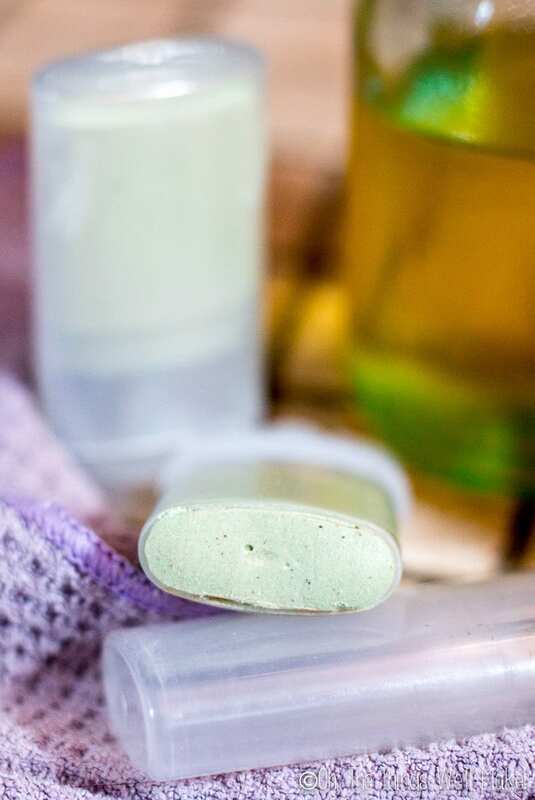 Soothing, yet effective, this natural homemade deodorant stick works without baking soda nor coconut oil, and uses zinc to help combat odors for those with sensitive skin. Melt together the shea butter, almond oil, beeswax, and zinc ricinoleate in a double boiler until the wax and zinc ricinoleate melt. Remove from the heat. Add in the zinc oxide, matcha powder, vitamin E drops, and essential oils, and whisk together well until the zinc oxide is well incorporated into the oils and wax. While still warm, pour the mixture into deodorant containers. You can also pour it into tins, or pour any excess into storage containers, for applying the deodorant by hand. Allow the mixture to cool off and set without disturbing it. Once it has set, you can use it immediately! Matcha is optional for antioxidant/anti-inflammatory properties and a bit of color. If you prefer a roll on deodorant, I have a new recipe for a natural roll on deodorant that also uses zinc. I'm allergic to beeswax or I am vegan and don't want to use it. What can I use instead? I haven't tried it yet, but am in the process of ordering some candelilla wax to try it out. It's a vegetable wax that is supposed to make a great substitute for beeswax in natural recipes. I'm going to try using it in some of my future homemade makeup recipes too. I don't have zinc ricinoleate. What can I use instead? I'd suggest adding it to help with the deodorizing abilities of this homemade deodorant, but if you are in a pinch and want to give it a try without it, you can leave it out. Because it is a waxy ingredient, you should replace it with an extra gram or two of beeswax to help keep the deodorant solid. If you just leave it out, you'll end up with more of a cream than a solid deodorant. I personally always use the zinc ricinoleate because I need the extra odor fighting. I've heard from several people who have made the deodorant without it. It has been effective for some, and not so much for others. Using them together, though, I have yet to hear from someone who says it doesn't work for them. So, if you can find it, add it! I don't have almond oil, but do have coconut oil. Can I use that instead? Yes, you can use coconut oil or another carrier oil instead. As much as I love coconut oil, I like to try to leave it out of my homemade beauty products because it solidifies at around 76ºF. The problem is that the consistency of the products can greatly change depending on the temperature outside. This recipe works best with a liquid oil, so coconut oil will work great in the summer, but I'm not sure how solid the deodorant will feel in winter. To avoid having that issue, you can either use a fraccionated coconut oil, which doesn't solidify, or use a little less beeswax when you make your winter batches with “regular” coconut oil. Why the matcha? Can I leave it out? I'm so glad you asked. 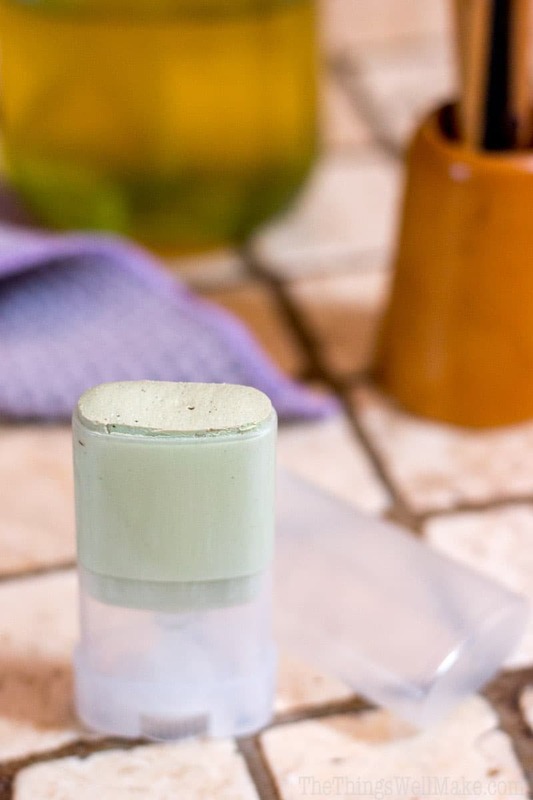 If you don't have any matcha, you can most certainly make this deodorant without it, but I think it's a great addition to this homemade deodorant. I started using matcha in my first homemade deodorant, a recipe that I almost posted on this blog last year. I had determined that dissolving the baking soda helped me to avoid the sensitivity issues with baking soda deodorants, but I hated applying a liquid solution of baking soda, so I made a deodorant stick recipe using a combination of baking soda and water combined with oils. I was mainly relying on the high pH from the baking soda to help make my homemade deodorant last longer without needing to add preservatives. To prolong the shelf life further, though, I added vitamin E to the oily part, and I added matcha powder to the liquid part. Honestly, that isn't necessarily a great idea because it isn't a preservative, but I figured anything that would make the deodorant more inhospitable to microbes would be welcome. Green tea, in the form of matcha powder, has lots of antioxidants, it's anti-inflamatory, and it makes the deodorant a beautiful shade of green! I loved it so much in my old recipe that I had to use it again here. Powders in anhydrous products like this one (something that only uses oils and waxes, and no water) also seem to help with the glide factor. All of that said, you most certainly can leave it out of the recipe! It worked marvelously for months, but I occasionally got irritation, something I didn't want if I were to share this as a recipe for sensitive skin! For those of you that prefer a deodorant with baking soda, though, I'll share my old recipe with you here. You'll notice several things that make this recipe not so ideal. First of all, there are oils and water without any emulsifiers or preservatives. I surprisingly never found any separation when using the mix. Perhaps because the water lever was so low? Beeswax isn't really an emulsifier, but perhaps it was enough to incorporate the small amount of water in this recipe. This is a small batch, and it's probably a good idea to keep it that way because it incorporates water without any real preservatives. (Baking soda will raise the pH which does serve to inhibit microbes from forming. The essential oils, matcha, and vitamin E don't really preserve at all, but may help it last a bit longer. I can't be sure that the pH is high enough to prevent bacterial contamination here because I've never tested it.) I had mine last a couple of months without any issues, but if you decide to try this recipe, and it starts smelling funky, don't risk it and throw it out! This was the homemade baking soda deodorant that served me well for quite some time. It's smoother than the average baking soda deodorant but grainier and not as smooth and creamy as my zinc oxide deodorant. Dissolve the baking soda in water over a double boiler. Add in the shea butter, almond oil, and beeswax and whisk over the double boiler until the wax and shea butter have melted, and all of the ingredients are well combined. Remove from the heat and whisk in the matcha, vitamin E and essential oils. Pour into deodorant containers and allow to set. This deodorant worked well for me for quite some time, so it may be worthwhile to those who are sensitive to zinc oxide, but that can handle baking soda when it isn't so abrasive. That said, I now much prefer the zinc oxide based deodorant and no longer use this recipe! Do you use cream or powdered zinc oxide? I want to make quite a few at one time just so I have them ready to go for myself. Can I just multiply the recipe for as many as I want to make or do I need to adjust any amounts for a larger batch? I did make this once and found the last few I poured were much harder and more scratchy than the first ones. Those were much softer, almost mushy. How many can I safely make at one time so I don’t run into that problem again? There isn’t really a problem making a larger batch- except for the fact that the powdered ingredients fall to the bottom, meaning that you’ll have more of them in the last ones that your pour unless you are good about mixing it all up before you pour each time. I was so glad to find your website and this recipe. I had made a baking soda diy deo from another site and that was great – until it wasn’t. After two weeks of application, my body reacted to the (organic!) baking soda. It took two weeks for the redness and itching to go away. When I found your recipe I was happy to find one using different ingredients. It took a leap of faith to purchase the somewhat pricey bits I didn’t already have. Well I have been using it for two weeks now and it is great. Not at all sticky, goes on nicely, still rather nicely dry. My skin feels soft. I love the color! One thing I didn’t do exactly to directions was that I added the zinc powder to the wax etc. in the double boiler instead of later by mistake. It took a while to melt the waxes – 30 min on low – but everything came out so nice and well mixed. Thank you so much for your hard work to make these recipes. I can’t wait to explore more! I’m so happy to hear it worked for you too! Ha! Over the years I’ve spent way too much on lots of oils and butters and waxes, etc., but if, in the end, it means we can find something that works for those of us who can’t find what we need, it’s totally worth it to me! Yes, you could try that. I’m not sure if it would be too solid completely exchanging it as I haven’t tried it. You could also lower the quantity of liquid oils and raise the amount of wax used. That said, changing the shea butter out for cocoa butter would probably be the best way to raise up the melting temperature of your deo. What I’d suggest doing is trying to make it with your substitution, but not adding in the heat sensitive ingredients like vitamin E and the essential oils (and not pouring it into the container just yet). Once the mixture cools, you can see if you like the texture. If it’s too hard, you can remelt and add more liquid oil. Once you get the consistency that you like, you can remelt it, add in your essential oils, and pour it into your container. I hope that helps. I’d also love to hear how it goes. Your results may be helpful for other people! Thank you very much for the recipe, I love it because it without baking soda, can I replace the matcha of something else & the almond oil of a coconut oil? I’m sorry that I overlooked this question when I answered the other one. The matcha is optional, so you can just leave it out if you don’t want to use it. Yes, you can exchange the almond oil for a different oil too. I made your recipe exactly as written. The deodorant turned out very nicely. I have to ask you though, how in the world do you get it to come off of your skin?? I used it for just two days. My skin is tacky where it was applied, and will NOT wash off. It has now been a week, and it is still there, slowing migrating down the side of my body. I have scrubbed with soap, water and a wash cloth repeatedly. It’s just stuck. I probably should have taken notice when I tried to wash off my utensils after making it, and even with straight blue Dawn dish soap, I struggled to get the residue off of my utensils and bowl. I haven’t used the deodorant (which DID work well) since the 2nd day. Don’t you have the same problem? I’m sorry to hear that it’s so hard to remove. I know what you are talking about when you say that the utensils can be hard to clean. Zinc oxide has a way of being a bit on the clingy side. 😉 I use hot water and that really helps dissolve it away. Honestly on my skin, I saw its pervasiveness as being a plus. Most of the time I only need to apply every other day, and I find that it doesn’t rub off onto my clothes, but stays on my skin. Normally I use such a thin layer that I don’t really notice anything being there. Tracy, I made a version of this deodorant, and overall like it, but I have a question. Is it possible for me to melt this down and add more ingredients, even though it already has the essential oils in it? I made this deodorant yesterday, and have used it twice, but it’s a bit abrasive for me. I just put it in glass jars. So I’m wondering if I can scrape out the deodorant, and heat it down and add some additional butters to try to make it easier on my skin. I’m just not sure what that would do to the essential oils in the deodorant. Any help would be great. Thank you. Yes, you can re-melt, but, yes, you are right that essential oils are quite delicate and may have issues with the heat. Because they aren’t really an essential part of the recipe, though, and are used more for fragrance, it’s not a big deal in this recipe. I’d remelt and then use your nose to guide you. You can add a tiny bit more of whatever EO you choose right before pouring into your containers. Just be careful not too add too many EO’s as they can also cause sensitivity in some people! I want to try this, but I don’t like the tacky feeling of natural deodorants, ie. the feeling of sweaty pits. Is there any way to incorporate a clay into the formulation to help absorb some moisture? You could definitely try it out. Some people also like to add arrowroot powder to their deodorants or body butters to keep them from feeling greasy. You’d have to experiment a bit to get a texture that you like, but it shouldn’t be too hard. I’d suggest making the batch without any heat sensitive ingredients like essential oils (so you can easily re-heat as necessary without hurting anything). You can make it in a double boiler insert or small pot and allow it to cool. Check on the texture and consistency and modify it as needed. Once you are happy with the result, do a final heating, add in the EO’s, and pour into the final molds! Hi Tracy! I’ve been making coconut deodorant with baking soda for many years. It was extremely effective but more times than not, I found my skin highly irritated. I was excited to discover and make your deodorant recipe for sensitive skin. However, I have some concerns with the batch I prepared. The deodorant is very thick and difficult to apply. It also comes off and stains my clothes with a tan color. Finally, the smell of the deodorant is very earthy. I don’t smell from perspiration which is fabulous but now the offensive odor is coming from the deodorant. Is this typical? I precisely made your recipe and even purchased the exact ingredients you recommended. Essential oils were used which faded away quickly. Can you provide some guidance what I can do differently to improve the next batch I make? That’s interesting that you say it’s too hard. I have had people tell me it’s too liquidy too. My suspicion is that the zinc ricinoleate is slightly different from supplier to supplier. I live in Spain and ended up linking to the only one I could find online for the US as people were asking me where to find it. Mine is very hard beads. Was yours the same way? It’s a wax-like substance that appears to me to be harder than beeswax. Mine ends up being a solid bar that glides on pretty well. I’ve had times where I was in a hurry and I didn’t let all of the zinc completely melt (I noticed as I was pouring into the dispensers) and my deodorant was much creamier and went on too thickly. That time I also ended up leaving behind stains on the clothes. I was able to get it out pretty easily, but, yes, it was frustrating. When I make the recipe the same way with my particular zinc, it turns out a consistency that I like, but you may have to tweak the recipe slightly to get it to suit you. Let’s see if we can troubleshoot for you. First, what are you using to apply it? Do you prefer a solid deodorant type dispenser or do you prefer to apply it like a cream? If you want to dispense it, you’ll want it to be more solid- if it’s too creamy, you can add more wax. On the other hand, if it’s too solid, you can reduce the wax amount slightly. Perhaps you can try with a different shea butter. Obviously, for now, though, you’ll want to use up yours. You could try using a bit less and increasing the amount of oil and wax to compensate for the difference. You can also switch out oils. Neither the butter or the oil are the active ingredients in this product- I’m just using them to get a consistency that I like, if that makes sense. Go through and take a whiff of all of your ingredients to see which ones you don’t like. Most can be switche dout without any problems, and I’m happy to help you try to figure out a good combo for you. You can leave out the matcha if you feel like it’s staining your clothes. I added it because I liked how it gave the product a pretty light green color and it has anti-inflammatory properties, but it isn’t essential to the recipe either. As for the essential oils- yes, one of the problems with using them is that the scent doesn’t last as long as a scent from a synthetic fragrance. There, you kind of have to decide what’s most important to you. A long-lasting fragrance will probably need to come from some other sort of fragrance oil. I prefer to stick with essential oils, but it’s something you could consider, depending on your priorities. I use lavender a lot because it tends to last a bit longer than some of the others. You can switch it up and experiment. I really hope that helps you. Hi Tracie, thanks for your feedback! I think you are right about zinc ricinoleate. My beads are hard and feel waxy. That waxy ingredient also coats my armpits and is hard to get off. I guess I need to use less? Does bees wax also leave a waxy film on the skin? Regarding the scent, all of my ingredients seem fine even the Shea butter. However, thanks for your suggestions about trying the unrefined butter. I have a feeling the culprit is the zinc ricinoleate which I might leave out when making my next batch. Thanks for all that you do and for all of your amazing/useful posts. ? Also, have you found the Matcha Tea to be a staining factor on hot sweating days… when white is worn. No, I haven’t had any issues with the matcha staining. You can definitely leave it out, though. The zinc oxide can leave a bit of a mark on darker clothing if you apply the deodorant in too thick of an application. If you rub it in, or make sure to only put on a very thin amount, though, you shouldn’t have issues. In any case, I’ve always been able to wash it out. I tried arrowroot in the past, but that did nothing for me. I haven’t tried (or heard of, actually) orris root. I have no issues with tea tree nor neem. I think it’s mostly the abrasive nature of the baking soda, but even when dissolved in water, it eventually (after a week or more of using it) will start to bother my skin. Tracy, first I want to say how much I appreciate the time and effort it takes to create these wonderful recipes and posting them on your site for everyone to use. I made your matcha deodorant recipe on Saturday and I absolutely love it. I am having a little trouble with it being too soft. When I appy it, too much goes on even if I don’t press very hard. I have stored it in the refrigerator and that helps but I really don’t want to run to the kitchen everytime I want to put on deodorant. Can I add some beeswax to the recipe, if so how much, if not do you have any suggestions for me? Also I want to thank you for the wonderful portion calculator you added to your recipe it’s THE BEST!! I think it may depend on the zinc ricinoleate and where you obtain it from because my final deodorant is rather solid, but other people have told me the same thing about their deodorants being on the softer side. My zinc ricinoleate is a very hard wax, so it must be doing a great job at giving me a more solid texture. You probably wouldn’t need to add very much, but I’m going to guess that it will be very forgiving, so… I’m not sure. I do think you’d have to go pretty far overboard to make it too solid. How long does it last before it goes off, given it doesnt have the preservatives that other recipes have.? This recipe doesn’t need preservatives because there isn’t water in it. (In the case of the one with baking soda, it should last several months without a preservative because of the high pH.) It will keep for as long as the oils are good (don’t go rancid). You’ll note that my roll-on deodorant recipe does have water in it, which is why it does need a preservative. That recipe has a shelf life of around 3 months, even with the preservative. Hi! Thanks for this great information! One of my problems the natural deodorant I’ve been using is the coconut oil in it. I end up with underarm oil stains on my clothing over time. So, I’m concerned about the almond oil in your recipe. Wouldn’t it do the same thing? Otherwise, I’m excited to try this out and to learn of zinc’s deodorant properties. Good to know! Also, do you happen to have this recipe in cups and teaspoons? I’m not used to measuring ounces and grams. Thanks! I’m sorry- I only do these sorts of recipes by weight because otherwise it is very difficult to keep the consistency accurate! You can find digital scales very inexpensively and if you plan on making more homemade products, they are very important, so you can get a lot of use out of them! I think that if you can keep the bar solid enough (the wax and zinc ricinoleate help with that), then you don’t really have to worry much about the oil staining your clothes because the layer of deodorant tends to stay put. If you find the bar to be too creamy, you can add a bit more wax to help prevent the deodorant rubbing off. I’ve never found coconut oil to stain clothes, though- well, it can leave a mark when you use it, but I’ve always found it easy to wash out without leaving any stain behind. I have occasionally put too thick of a layer on and had some rub off on clothing (mainly when the batch has been less solid because I’ve measured and made it in a hurry and put too little wax in), but I haven’t really ever had a problem getting it off with soap and water. Most of the time, though, that doesn’t happen. Can I skip Zinc Ricinoleate? You can try it without the zinc ricinoleate, but I wouldn’t just leave it out of the recipe. Instead, try substituting it out for more wax. You may need to even add a little more wax than the amount of zinc that you are substituting out because the zinc is a hard, waxy substance that helps make the deodorant more solid. Without it, the deodorant would be more of a cream rather than a solid bar. Can I change that Matcha with Charcoal? You could try it, but there are two things you might want to keep in mind before doing so. Charcoal can be slightly abrasive, so it may be irritating to the skin. I added the match because it is anti-inflammatory and I figured it may help soothe the skin. The other potential problem I see is that the charcoal may stain clothing. I haven’t had any issues with matcha staining my clothes. The matcha is completely optional in any case, so if you don’t want to use it, you don’t need to. Have you had good results with the candelilla wax? I have it at home, but to be honest, I haven’t used it much. It does appear to work very well as a substitute for beeswax, though. I had a lot of beeswax from long ago, so I usually just use that. For those who are vegan or sensitive to beeswax, it’s a great option! Hmmm, no. I’ve never had that happen. Mine is normally a nice shade of green because of the matcha, so that may cover any changes. Mine has always stayed green like that, though. What else do you have in your deodorant? If you don’t want to post it here, you can email me at [email protected] or you can join my Facebook group where we can try to pinpoint the problem. Do you have anything like aloe vera gel or something similar in it? It is shea butter, sweet almond oil, beeswax, baking soda, zinc oxide, arrowroot powder and natural fragrance inside. Hmmm. Interesting. I’m not really sure what the issue is then. When you say “natural fragrance,” what does that mean? If it’s a water-based product, that could cause issues. On the other hand, if you’re using essential oils, that shouldn’t cause any problems. Tina, can you tell me the amounts you use in your natural deodorant? Thank you. Hi! I may have missed this but please address melting issues from the heat! Are you in a hot part of Spain? I am in the very hot and HUMID southern US and no matter how cool my house is, the diy stick deodorants get so soft in the summer. I love the stick idea because I dont want to rub it in. Beeswax is right out- a little for good glide but it melts. Have you worked with any harder waxes? I have on other recipes and theres a fine line between too much and too little! Yes, my house is very hot right now! My coconut oil melted weeks ago and things are very hot and sticky. It’s a semi-tropical climate here and I have lemon, lime, mango, and avocado trees growing at my house! I don’t have any problems using this deodorant when it is hot out. I haven’t left it in the sun, though, so I’m not sure how much it can handle. Luckily, the waxes (beeswax and the zinc ricinoleate) have much higher melting points, so unless you are going above 140ºF, they should help keep the product mostly solid even at higher temperatures. If you find that the baking soda irritates your skin like it does mine, perhaps you could try with only the zinc oxide. You’d have to probably add some more wax to it to help thicken it into a bar because the ZR is waxy, but I know that it has worked for some people without the zr. I’m sorry it didn’t work out for you. I have issues with the zinc PCA in the roll on deodorant recipe when I use it at levels strong enough to work for me. I was using it for months, and I’ve actually gone back to this one. I still make the roll on for my husband because it’s his favorite. I guess we each need to find the best formulation for us! I’d be interested in buying it! I totally understand the struggle of trial and error with these things, but I’m excited to give this recipe a go! Email me at (removed visible email for privacy reasons) if you still have the zinc for sale. Thanks! I don’t sell the deodorant or the ingredients. I just show people how to make things themselves. I do link to places where you can find the ingredients within the recipe. If you click on the ingredient, in many cases it will take you to a place where you can find and buy that particular ingredient. I hope that helps! I noticed the natural homemade deodorant for sensitive skin recipe is available in ounces or grams. But the one for baking soda deodorant for slightly sensitive skin is in tsps and Tablespoons. Is there any way you could list the natural homemade deodorant for sensitive skin in tsp and T? I was hoping I wouldn’t have to buy a kitchen scale. Hi Jane. I converted it to tsp for myself but double checked with a scale. Here’s what I got. Shea butter is about 5 tsp, oil about 8 tsp, beeswax was 3 tsp, zinc ox was 4 tsp, and the zinc r. was .3 tsp or .05oz. Also, mix up that zinc oxide really well. Some of mine sank to the bottom of the mixing bowl and didn’t quite make it into the container. Good luck! That’s very helpful! Thanks, Christine! Hello thank you very much, I have not been able to comment on the publication in Spanish, can I replace the shea butter with the cocoa butter? Could the zinc oleate ricino be replaced by another? Here there is also the fractionated coconut, within the inputs, this is what I have at hand to get your recipe. thank you very much I also use a talcum powder with essential oils. Thank you for alerting me to the problem with the comments. I’ll look into it to see if I can find the problem! If you replace shea butter with cocoa butter, you’ll end up with a more solid bar. I’m not sure if it will spread nicely so you may have to switch it for cocoa butter + a bit of oil (maybe the fractionated coconut oil) to help soften the bar. (It may take a bit of experimentation to get the perfect consistency). I’m not sure of anything you could exchange for the zinc ricinoleate. It helps deodorize. That said, some people have tried the recipe without it and find that it works well for them anyway. (Others have told me it works much better for them with the ZR). Do you understand my answer? Or would you prefer that I translate the answer? This sounds like a great deodorant recipe! I have everything but the zinc. Was wondering if mango butter can be used in place of the shea butter? I’m thinking it may be too soft? Thanks! I love mango butter too. I stuck with shea because more people have it on hand, but I’d think that mango butter would work well. As you’ve said, though, yes, it may make for a thinner final product. You could add just a tad more beeswax to compensate for the difference. Unfortunately, I can’t tell you how much as I haven’t tried it myself yet. I’d probably err on the side of using not too much so you don’t end up with a hard bar that is difficult to spread. I’d love to hear how it goes if you give it a shot! Thanks Tracey! Just submitted another comment with my results. I used a mango/shea/cocoa butter blend and grapeseed oil. A few drops of meadowfoam oil and a little peppermint eo. I liked the consistency but the zinc r. didn’t agree with me. I chose those oils because of their “drier” quality. You just have to tinker with it until you find the right mix for you. Your recipe is a great starting point though! Hi Tracy! So far I’m liking this deodorant!! Need to up the beeswax a little in the next batch though, its a little melt-y. Thank you so much! In any case, I’ll try… this is the link to the product on the Spanish Amazon. I have been looking for DIY recipes with zinc and magnesium in them and without baking soda. I’ve read about magnesium hydroxide being helpful for natural deodorant use. For your sensitive skin recipe, how much magnesium hydroxide would you recommend adding? The pure product comes in a powder form. Also, I have jojoba oil. Could I use that instead of the sweet almond oil? I’m not sure about magnesium hydroxide as I haven’t used it. I will say that I tried using magnesium oil as a deodorant and didn’t find it effective for me. I also found it irritating to my skin. I’m not sure if magnesium hydroxide would behave similarly. If you do decide to try it, though, I guess I’d probably try switching it out at the same amount. As for the jojoba oil- that is definitely a switch that you can do without any problems! Switching it out for what? I didn’t want to take out any ingredients (other than the matcha) I just wanted to add the magnesium hydroxide powder to the recipe. I did read that (Philips brand) MoM isn’t a good choice because it adds bleach to the formula. But some cheap drug store brands do not have the bleach. However I don’t want to use a liquid milk of magnesia alone. Personal preference. The last few days I’ve been using Desitin cream as a deodorant since it has the zinc oxide and it’s working pretty well. However it’s messy and has other ingredients I don’t want to continue using. Anyhow, I really like the idea of both zinc and magnesium since I know both are good for me and both seem to work well in deodorants for many people. I was hoping to figure out an amount of the magnesium powder to add to your recipe. If it’s a powder, I’d just add in a small amount to test it out- maybe 1/2 to 1 tsp. I’d probably err on the side of using less the first time to see what the resulting texture is. If you find that it gets too thick or solid, you can add a little more oil the next time to compensate for the extra powder. That would also allow you to test out the difference between the batches to see if you think it makes it more effective, more or less irritating to your skin, etc. I’d be interested in hearing how you think it works- if you think it increases the effectiveness, etc. While I’m quite happy with what I’ve been using, it may be helpful for others who have issues with the zinc oxide. Thank you for the suggestions. Since I plan to try it with both magnesium and the two zincs on my first attempt, I won’t be able to make a comparison with your original sensitive recipe. If I have problems with it such as skin irritation then I would leave out the magnesium and just make the recipe the way you have it written up. I really appreciate your help. I had read a lot, tried a few natural deodorants off the internet and then fine tuned the ingredients I want to use but I really needed the amounts in a recipe. we are all supposed to sweat and expel toxins through our pores—-period—–so it is natural! i’ve used a recipe on another site with the best success and i modified it to my liking! it’s similar to my own—–but it has a better feel to me since i apply it with my finger! i don’t like the applicators like tubes, etc… since most irritate my skin when i apply! if anyone would like the link or more info—-i’ll post with your and the other person’s permission! Candelilla wax is a good, vegan substitute for beeswax that works well for those with allergies or who otherwise wish to avoid any animal products. i found that my favorite recipe that i mentioned earlier in my first response contained water and has to have additional anti-microbials such as your leucidal because water breeds microbes. these anti-microbials may very well be the extra ingredients to allow my deodorant to last for 2 or more days before b o sets in again. in any case, to prove how sensitive i am, i can’t use candelilla wax, tea tree oil, chamomile, almond oil, matcha, bee’s wax, and the list goes on! ever since i was diagnosed with cancer 2 years ago, i have tried to further reduce my intake of toxins. through the years, i’ve cut toxins dramatically, but it is harder here in the usa than many people realize. even though i have not tried any of your recipes, i have tried enough in my 63 years of human errors to realize that your ingredients alone will work to dispel b o quite well! thanx again for all of your info, recipes, advice because i am ever learning since knowledge is power and until i experience something whether recipe, food, etc… i don’t know my body’s response to it! Sometimes you can get away without the use of a preservative if the product is in an extreme pH range (above 9 or below 4). The main natural preservatives don’t work very well in those pH ranges anyway. I’m guessing that you would be sensitive to a product in those ranges, though. My roll-on deodorant doesn’t use zinc oxide and instead uses zinc PCA, but that could be potentially switched out. My husband is sensitive to zinc PCA, but doesn’t need a lot of it so he still favors that recipe. Of course, the zinc oxide is more likely to stain, but if you are sensitive to the other ingredients, it makes sense to use it. Are there any waxes you can tolerate? There are some lovely floral waxes on the market that you could use to solidify the product more- though if you say that dispensers bother you, then you probably don’t need to solidify the product. Preservatives (radish and coconut), Olive M Emulsifier, Zinc Oxide, Fragrance(Essential oils). i tried bay essential oil in the deodorant, but, i developed a headache from it as well as a slight irritation. my deodorant keeps me fresh for 2 or more whole days and i really stink like nothing you’ve smelt before! i produce a very high acid chemistry which causes the strong smell both from the excretions through my pores and the bacteria that comes from the breakdown of the excretions(growth of bacteria)—–normal for most people with type o blood! my cancer was removed. however, i live in fear since it runs on both sides of my families and many have died from it! my psa was normal last time i checked. so, considering the prostate was removed, i’m a little more at ease. the big issue here is will i develop another cancer. i have made my own products such as soap, toothpaste, deodorant, body wash—shampoo and more for years. my best first bar soaps were from light oils such as apricot kernel oil, grape seed oil, avocado oil. the drawback was they were drying soaps yet my body skin liked them and my hand skin hated them! i like detergent based body wash—shampoo because all soaps now irritate my body horribly especially superfatted or oily soaps! i use Decyl Glucoside with water and the preservatives i mentioned above and my body skin no longer itches to high heaven like it did with bar soaps and commercial products! thanx alot for your concerns and i wish your whole family freedom from cancer! i found out recently from my sister’s dna search that my ancestors came through turkey 1000’s of years ago with ancestors from many regions of the world including spain. but, the test called my relatives iberian as opposed to spanish or any other term! thanx again!!!!!!!!! Yes, I referred to staining clothes from the zinc oxide. I didn’t really have too many problems with it with this deodorant, but it did concern some people. I was concerned that a water-based product with zinc oxide would be more likely to stain, though, but that may not be true. I also like decyl glucoside. I just started to experiment more and more with surfactants, and want to start introducing more surfactant based products to the blog. Some people think that only soap based cleaners are natural, but the gentle surfactants are really great for people who don’t react well to the high pH of soap, and they also come from natural sources. I quite like them myself. And thank you for the well wishes. I wish you the same. I’m happy to hear that things are going well for you, apart from the sensitivities. Be aware that zinc oxid is a nanoparticle ! It’s quite easy to find non-nano- zinc oxide to use. You’ll notice that I linked to a non-nano- zinc oxide. This is a wonderful recipe for sensitive skin. Does not burn like the magnesium deodorant recipies. Thanks for sharing. I tried to use magnesium at one time, too, but while it didn’t burn my skin, it wasn’t effective for me. I’m really happy to have found something that really works for a lot of people who were otherwise frustrated! Where do you get your deodorant tubes from? I’ve tried eBay, Amazon & Etsy & they’re all super expensive! Cheapest I could find was around $15 for 1 tube! I have to admit that the tubes that I used were rather small, like these tubes, and I bought them for using for multiple projects- stick blushes, deodorant, etc. They are a bit small, but are practical for traveling and bringing it with you. I wanted to make the smaller tubes because I wasn’t sure if I was going to have to apply throughout the day when I first made the deodorant. Luckily, that isn’t necessary, so I don’t really bring the deodorant with me anywhere unless I’m traveling. There is another alternative that I’m hesitant to give you because I don’t like to advocate waste, but you could buy a cheap solid deodorant and remove it and use the tube for your own homemade deodorant. If you go this route, clean it thoroughly with soap and warm water, and then do a final rinse with something like rubbing alcohol. I agree that it’s frustrating that the empty tubes are often more expensive than a tube with product already in it! I just ordered 8 – 2.5oz tubes for about $12 on Amazon. Comes to $1.48 per tube. Keep checking Amazon, their prices bounce around alot! Did you find that the zinc deodorant continued to harden until it was practically impossible to apply? If not, I wonder what I did wrong. I did notice that the zinc seemed to sink to the bottom. Any tips would be appreciated. I have tried loads of homemade deodorant and this one has the best odor protection of them all. I would love to be able to make it work. No, I didn’t have that problem at all. Which zinc sunk to the bottom? The zinc ricinoleate should fully melt and easily incorporate itself into the oils. The zinc oxide, on the other had, may sink to the bottom to a certain extent. Ideally, you can wait until it’s starting to cool to pour the mixture, but not too much so that it’s too hard to pour. If that’s too difficult, you can also use a type of electrical whisk to really get the zinc oxide to stay more suspended in the rest of the ingredients. I just wanted to let you know how much I appreciate you posting this diy deodorant recipe. OMG! I had been having the exact same issues you were with the baking soda and had been looking for a recipe without it for a long time with no success. Then I finally came across yours and when I read what you had been going through I thought you were talking about me. I was so excited to try your recipe out and I’m so glad I did I love it! I can’t thank you enough for posting that recipe it has helped me more than you know. I’m so happy to have been able to help! I use a DIY spray deodorant of which the base is zinc oxide, magnesium hydroxide and vodka. It works very well but goes on wet so have to let it absorb and dry before dressing. I will try making yours with the zinc ricinoleate and see how it compares to what I’m currently using. Love your site–and have particularly liked your info on making liquid soap which I will also be trying shortly. I noticed that it’s mostly environmental concerns, with a slight concern that it could cause respiratory concerns if used in a spray. I don’t use it in a spray and use it in a very, very small dose in our liquid deodorant. I had a mishap once where my scale was off, and one of the batches used more and it also irritated my husband’s skin. I tried making it without once, and it worked for my husband, but wasn’t enough for me with just the ricinoleate. I think with these sorts of things, it’s good to experiment and find what works for you. I need something stronger than my husband does. We’re probably on our 5th batch now. I wanted to make one final batch before posting. With the zinc PCA, it works out to being like a pinch used in a batch that lasts several months. I think as long as you use it responsibly, and are careful where you throw it away, that it’s probably not too bad (especially when you compare to what else is out there). I think the ideal would be a liquid deodorant with just the zinc ricinoleate because occasionally the solid one can build up on clothes after time, but for me it just isn’t enough. Hi, I’m really excited to try this recipe! I was just wondering if you have noticed that the shea butter or zinc oxide stains clothes? I noticed this with another recipe I tried using shea butter beacuse it’s yellow. The beeswax was yellow also. I just want to make sure it’s not going to stain my shirts- espeically when I wear a tank top- before making it.If i need to bite the bullet and find beeswax and shea that isn’t yellow I can buy new. I just have quite a bit of the other on hand. Sounds like a great recipe though. I’ve tried everything for both myself and my husband, so hoping it works for us! I was wearing this for months and months without it staining anything, but I have to admit that it did start to build up a bit on some clothes after using it a lot. I was able to get it out, but the zinc oxide can be a bit of a pain if you let enough of it build up. You don’t need to use a lot of this deodorant, so I think the secret is to use a very thin layer. In the summer, that can be a bit trickier because the bar is less solid from the heat. (I find in the winter that the deodorant is solid enough to go on smoothly in a very thin layer.) You could try rubbing it in well before putting on clothes to help prevent the buildup. Hi Tracy, So glad I found you! I have been experimenting with natural deodorants for a while and have been very disappointed. I am currently awaiting Amazon to deliver supplies to make your recipe. My question is: Have you posted the recipe for the liquid deodorant with zinc PCA yet? Thanks so much and I will let you know how it goes. No, I haven’t posted it because I’ve been experimenting with more common emulsifiers to make it work well. I had made the first batches with Montanov 68, but it appears to be hard to find in the US. So, I tried with Olivem, but it separated and got weird. HI! I was THRILLED to find this post. I too went on a harrowing 2 yr journey with DIY deo, including spending the small fortune on the neem oil recipe and practically gagging when putting it on. I’m about 2 months into using your recipe here as-is. I can’t say it’s as good as the primary baking soda one, but no rash, so it’s winning. Few questions for you: It seems pretty lotion-y to me though… have you tried anything to make it a bit drier? I also feel like it doesn’t do as good of a job of keeping ME mostly dry. Thoughts? With the lotion-y texture it seems like it clogs up my razor, gunks up my screw-on container top, and the matcha green leaves an unappealing cross between pale green deo and pale yellow sweat. ewww. It shouldn’t be lotion like at all. Mine is very solid, so something is off in your batch. Did you leave anything out, like the zinc ricinoleate, perhaps? Some people have left it out, and find it’s a sticky, pasty mess, and it isn’t as effective without it. Zinc ricinoleate is a waxy like substance and it helps solidify it. You could otherwise solidify it more with more wax, but you’ll be missing out on the effectiveness of the zinc r.
nope, i followed the recipe to the T. maybe i misread something. will try it again! thanks for the response. i tried it again tonight, using the recipe for “4” servings and on metric. it’s maybe a little bit drier, but i’d still put it in the lotion category. i’m using a scale and taring it properly (am no stranger to recipes like this). and i’m in the bay area, so far from a tropical climate. would you mind checking that the proportions are correct with the little calculator above and my selections? Great post! Thank you for sharing! I’ve been struggeling for years to find the perfect recipie for myself as well, your post has all my struggles with baking soda. I always end up super irritated but no one in my family seems to have trouble with it And my friends are all good with it too. I thought it was just me who reacted badly to it. I then started using arrowroot powder and DE for my recipie. So far its okay. Leaves my skin smooth but doesn’t help much with the sweating and I still have a bit of odor. I feel as though the DE absorbes the esssential oils I add and. i can hardly smell the essential oils. I will try zinc oxide in my next recipe. I actually just bought some for my home made sunscreen I’m working on and I”ve been thinking of adding it to the deodorant but wasn’t sure. Does this recipie keep you dry? Also instead of the matacha powder, could I add green tea extract for the antioxidant properties? I actually have some that’s why I ask. Also do you think it’s okay to keep the DE in my recipie. Or do you think this may change the properties of the deo? I just bought so much of it that I wouldn’t know what else to do with it haha! I hope the zinc helps you! I will say that this recipe is formulated to use both zinc ricinoleate and zinc oxide. Without the zinc ricinoleate, the texture will be a lot pastier because the ZR is a waxy type substance that helps give a solid consistency to this deodorant. Some people have tried this recipe with only the zinc oxide and it has worked for odor for some, and not so much for one or two people. I think the zinc ricinoleate really helps a lot too as it’s specifically made for deodorizing purposes. As for dryness. I’m not sure that it really helps with dryness at all. It may help somewhat, as you create a sort of barrier, but it doesn’t have any anti-persperants (unless one of the ingredients has anti-persperant qualities I’m unaware of), so you will still sweat. I used to have a lot more problem with wetness. I don’t notice any problems recently, but that could be due to any number of factors. I sort of doubt it’s the deodorant, but you never know. As for the green tea extract- while it would probably work, there is the danger that green tea extract is water soluble and could introduce bacteria into the mix. I’m also not sure if it would separate out or not. In any case, you don’t really “need” either, but I just liked the idea of adding some color/anti-inflammatory properties to the deodorant, seeing as I always have matcha powder at home. Whether or not it’s helpful, I don’t really know for sure. Good luck, no matter what you decide to try! I hope you find something that works for you! Thank you so much your tips! I’ll keep experimenting. Have you also heard of adding probiotics to deodorant recipes?! Guess what arrived today?! I am going to try melting my original batch and adding the zinc ricin and will let you know if that works better! This evening I made up your recipe with baking soda and added some lemon juice to the mix, and can’t wait to see how that works as well. I do want to say that with the other recipe, the lemon juice is probably working against you. The reason I think it works is because the pH of the baking soda is high enough that it makes it a inhospitable place for bacteria. The acidic lemon juice will likely react with the baking soda to neutralize the pH, something you don’t really want. I was so excited to try your deoderant as the ones with baking soda give me a terrible rash. I ordered all the ingredients needed but unfirtunately the zinc ricin. did not arrive with them. Decided to try it without as I am desperate and figured the zinc oxide would help my underarm rash too. Unfortunstely I was stinking by the end of the day (my worst nightmare lol). Anyway they say it will be here within the next week so I will try it again and hope it works. I guess I will be stinky for a while still. :( Keeping my fingers crossed that the zinc ricin. Is the secret! I really sorry to hear it didn’t work out for you without the zinc ricinoleate. I’ve heard people some people say that it has worked well for them without it, but I’ve personally never tried. Of course the deodorants that don’t work at all for me do work for some people, so we are all different. In my case, I’ve been making a liquid deodorant with zincPCA and zinc ricinoleate for my husband, and it works for both of us. That one doesn’t have any zinc oxide in it, and is still effective. I’m hoping that means that the zinc ricinoleate is the more potent part of the recipe, and this deodorant will work for you when it arrives. My guess is that your recipe without it turned out slightly pasty and messy. Because these ingredients are all oils and waxes, and there are no water based ingredients, you should be able to melt your batch and add the zinc ricinoleate when it arrives. That way you don’t end up with a wasted batch! I have my fingers crossed with you. I know exactly how frustrating it is when nothing works! Is the zinc oxide paste or powder? Also, have you tried substituting arrowroot powder or cornstarch for baking soda? If so, what was your experience? Thank you! The zinc oxide comes in a powder form. Arrowroot and cornstarch do absolutely nothing for me when it comes to helping stop body odor. I think they are usually added to deodorant recipes with the idea that they will somehow absorb some of the wetness, and/or to help make them feel less oily and help keep the oilier recipes from staining clothes. I have my doubts that either could really help prevent body odor for most people, though. I’m convinced that the baking soda works by changing the pH enough to make it difficult for the bacteria that make up body odor to multiply. Neither cornstarch nor arrowroot powder do that. Very inspiring post. 🙂 I have one question, where can I get a hold of the containers that you put the deodorant mix in? Well, you have a couple of options. You can either repurpose an old solid stick deodorant container. I clean out old cosmetic containers as best as I can and then throw them in the dishwasher to help fully clean them. You can also find empty deodorant containers online. I used tiny 15ml containers in my pics, and was using those for a long time. I ended up making about 5 of those with this recipe. I liked them because I could take them around with me, on travel, etc. Since then, though, I’ve realized I don’t need to bring them with me because the deodorant is effective all day. Having so many tiny containers only means I need to clean out more containers when it’s time to make more. So I’ve since bought 1 larger container (75ml) and this recipe basically fills it almost perfectly. Does this deodorant have to be refrigerated when not in use? There is no need to refrigerate this deodorant because there isn’t a water component to it. It will keep for as long as the oils keep without going rancid. In the recipes that I make with water, like my basic lotion recipe, I use natural conservatives so that you don’t have to worry about refrigerating in those recipes either. Most of the most natural conservatives will help a product last for 3 months without refrigeration. I could have written this! I tried EVERYTHING and my pits were sooooo chaffed and had a huge red rash. I put my baby’s diaper rash cream on them yesterday because I didn’t have anything else. And at the end of the day my pits were not stinky! I was shocked. So when I came across this post I got so exited! Can’t wait to try this recipe. It seems amazing that it’s so simple. I still can’t understand why there are so many natural deodorants out there that just don’t work! Or why they still use aluminum instead! Hey! Thanks for sharing your experience! I have two questions. One has to do with the zinc ricinoleate. I can’t find it in the Netherlands, do you think the deodorant will work the same if I just use the zinc oxide? And the second question is where do you buy the essential oils? Are they pure essential oils? Thanks! Looking forward to your response so I can make my own deodorant. I’ve heard people trying it and saying it works, but they end up with a very pasty texture. The zinc ricinoleate is hard like a wax, and it makes the product more solid. You could perhaps try changing the zinc ricinoleate for a wax like beeswax to at least help keep the texture the same. I’ve recently been making a liquid deodorant with zinc ricinoleate and zinc PCA, and it’s really effective without the zinc oxide, so the zinc ricinoleate in itself probably is a good deodorant, but it can’t hurt trying without it. I tried doing a search for you in eBay and Amazon, but the only place I find it is here in Spain and it doesn’t appear that they send to the rest of Europe yet. It appears to be called Zinkricinoleat in German. It surprises me that your wouldn’t be able to find it in Germany- usually they have a lot more to offer than the places here in Spain. If you do try it, I’d love other how it goes! Thanks for your super quick reply! Ok so I do have beeswax, so I can definitely try it with it. Also, I found I can buy Kaolin klei, which has Zinc in it and Calamine powder which has zinc oxide and zinc carbone… Do you think that could also work out? It’s hard for me to know for sure what would work or not, and how any of them would affect the texture of the deodorant. Adding a powder or clay would likely solidify it more, and anything with zinc in it would likely help add to the deodorant properties, but without having tried it myself, it’s really only a guess as to what the result would be. If you do give it a try, I’d love to hear how it goes. And sorry again for having overlooked your comment. I do make a point of answering people as soon as I can, and hate when I overlook comments like this one! Have used this for 6 months – so effective! Love it! Thank you for not giving up in your quest for a great product. I’m so happy to hear that, Tami! Yes, I tend to be a bit stubborn, and just can’t bring myself to posting something that I don’t love myself. If you only knew how many body butters I tried to make before finally delving into making lotions. Now I’m inspired to continue. If you like roll-on deodorants, I’m planning on posting a new roll-on option soon. (My husband hates solid, so I had to make it for him.) It’s working amazingly well too, and is light and nice for summer. Super excited to try this recipe! I had tried one with just coconut oil and corn starch and essential oils and I found I had to reapply it two or three times during the day, even when just sitting at a desk at work all day. I was wondering how many tubes this fills? I hope this goes well for you. I don’t need to apply it at all during the day, and even with some conventional deodorants, I wasn’t always making it through the day. Th last time I made this, I ended up filling one 75ml container, which makes sense because I think I fill about 5 of the tiny ones, which I think are 15ml each. I’ll have to make sure to make sure next time I make this. I made it! I left out the zinc ricinoleate because I didn’t have it and I added in some bergamot essential oil also and it works pretty great! I sweated (like you’re supposed to) and couldn’t smell anything! It goes on a little pastier than I was expecting (think the texture of diaper rash cream), but I just rubbed it in a little bit and everything was fine. However, I think I disturbed my deodorant tube too soon because it won’t go up and down, it just stays stuck in there. I’ve been applying it with my finger. Lessons learned for next time! And we’ll see how it holds up come summertime! Thanks again for the great recipe! I’m glad it’s working to combat the odor, even without the zinc ricinoleate. I think I’m going to have to update the recipe with a note about leaving out the zinc ricinoleate. Somebody else told me that they left it out, and that they also ended up with a pasty mixture. The zinc ricinoleate feels like a hard wax, so I think leaving it out is causing the texture to be completely different from mine. Mine is very solid, and only goes on in a thin film. I made the mistake of microwaving the leftovers once to quickly pour them into a tiny tube, and that made the mix really pasty and I didn’t like using it nearly as much. Can you give measurements for the US? When I change the recipe to US on the page it shows up in ounces. Can this be measured using teaspoon and tablespoon measurements? If you are planning on making more DIY natural products and/or soaps, it is worth the investment to buy a small, inexpensive kitchen scale for these sorts of recipes. Otherwise it’s impossible to get precise measurements, meaning that your final products may not turn out as they should. I usually use grams when working with weights, not only because it is more universal, but because using the term “ounces” often confuses people. They aren’t sure if you are talking about weight ounces or liquid ounces; in this case it’s the weight ounces. Hello! Do you think it would work to just use castor oil instead of zinc? Maybe replace the almond oil with castor and leave out the zinc? Just trying to use up the ingredients I have on hand?. Thank you in advance for your reply! The zinc is the active ingredient that I have found to work for me at keeping away body odor. I can’t imagine this deodorant working for me without the zinc. On the other hand, if you were to want to just replace the almond oil for the castor oil (while still using the zinc), that probably would work fine. Keep in mind, though, that castor oil can be more drying to your skin. Was just browsing the internet for zinc ricinoleate deodorants and stumped on your blog…. I’m curious to what you mean about the deodorant not being any more deodorizing, though? Do you mean if you only used castor oil? I really prefer the main recipe which uses zinc and doesn’t use either one. If you are looking at my old recipe at the bottom, and want to try that one instead, I find that baking soda works a lot better than bentonite clay for odors. The baking soda alters the pH, making it less desirable for odor causing bacteria. I don’t know what bentonite clay would do in a deodorant recipe. My guess is that it may help absorb some of the moisture, and may slightly help with the impurities in armpits, but I doubt it would be enough to combat odors. If you read through the entire post, you’ll see how many different things I’ve tried, most of which didn’t work for me. The baking soda deodorant did work successfully, but irritated my skin after awhile. It was a lot less irritating to me, though, than most of the deodorant recipes that I’ve seen floating around the internet that use coconut oil and baking soda. Hello! I am also living in Spain. How was it finding these ingredients? Did you have to order them online or did herbolarios have them? Well, I order quite often from a few places online anyway because I find that I save a lot of money compared to most of the herbolarios that I can find locally. The herbolarios do have the oils and essential oils, but I doubt they would have the zinc ricinolate. The zinc oxide is a maybe. 🙂 I tend to save the herbolarios for most of my food choices. I think everything for this can be found at this place called cremascaseras.com. I’m not an affiliate for them or anything, but I have bought a lot of stuff from them and have overall been happy with them. I did have an issue with them once where I couldn’t get a discount to work (They give you a percent discount for your next order), and they never really answered the problem, but the orders have always arrived really quickly and well. I hope that helps somewhat! I’m wondering if this deo helps with perspiring? I certainly don’t like to stink, but it’d be nice to not feel wet either. I also find a lot of the “natural” deos not working for me. I was researching the ingredients but don’t want to spend a lot of money before I know. Thanks! That’s a great question, and I wish I had a better answer for you, but I have to answer I don’t know. Let me see if I can better clarify my answer now. When I was younger, I remember being embarrassed about sweating a lot from my armpits in the summer when using commercial deodorants/antiperspirants. It hasn’t been so much of any issue for me lately, now that I think about it, but I don’t know if it’s because I just don’t sweat as much or if it has something to do with the deodorant itself. Commercial antiperspirants use aluminum salts to plug the pores and keep the sweat from coming out of those pores, from what I understand. I’m not sure if zinc would do anything like that. I will say that I have seen recommendations for people who have problems with excessive sweating to try supplementation with magnesium and zinc. Also, this goes on like a thick cream, and I’m not sure if that would cover the pores in a way that would keep some sweat from coming out? What I will say is that I haven’t had problems with excessive sweating from the armpit area lately, but I have no idea if it has anything to do with this deodorant. I am ecstatic with the way this deodorant works for me, though, and I wouldn’t go back to using anything else. If it helps, I can try to better monitor my perspiration over the next few days and see if I can give you a better guess about how effective this may be. (Even if I don’t sweat much from my armpits when I go hiking with my dog this week, it may be due to other factors- my diet these days, or who-knows-what can affect perspiration- but I’ll try to give the best guess I can.) Sound fair? Ok, this just popped up in my Pinterest and I read it all the way through. I can tell you, your story is my story! Coconut oil/ baking soda was working marvelously for such a long time, and then my flare ups for to the point where I felt my lymph nodes were getting tender, so I stopped right away. I spent money on all the clay formulations only to find none of them worked, and some were stay enough green (with unbleached shea butter) that it wasn’t good on my clothes. And my husband was also helpful in letting me know of the failed attempts. I’ve tried so many brands of natural stuff and finally found the Nubian heritage stuff to work-but it’s spendy! I’d decided I was done trying new recipes until I saw one with a vastly difference ingredient list. As soon as I can gather the zinc stuff and matcha powder, I am going to give this a go! Based on our similar problems, I’m very hopeful! I really hope it goes well for you. I’m still using this recipe, and it is still working well for me! I’ve made several batches by now. Right before this, I had just spent a lot of money on a natural deodorant from the health food store that did nothing for me either. I’m still holding onto it for some strange reason, probably because I wasted so much money on it. hahaha I need to just throw it away because I know I’m not going to use it. I look forward to hearing if it works for you! I have my fingers crossed! Instead of matcha powder can any other powder be used? I have arrowroot and beet root powder. Would those help in binding? If you don’t want to use the matcha, you can just leave it out. It isn’t there for the binding at all. It’s just added for it’s antioxidant and anti-inflammatory properties, but it’s totally an optional addition. I never even heard of zinc ricinoleate. Interesting! I tried a deodorant recipe last summer using DE along with a homemade mix of calamine (zinc oxide + iron oxide). I think I even had some clay in the mix. It seemed like at first it worked and I especially loved how soothing it felt on my skin. Over time it didn’t work. Definitely an inspiring recipe that has me thinking of incorporating into my recipes. Have you tried magnesium? Great post! I thoroughly enjoyed reading it. For me it’s been working wonderfully for a couple of months now, and, yes, it’s very soothing and so much nicer feeling than anything else I’ve tried so far. Plus, it works all day, even when I get wet.